Evidence is steadily accumulating that insufficient sleep increases the risk of obesity and undermines fat loss efforts. Short sleep duration is one of the most significant risk factors for obesity (1), and several potential mechanisms have been identified, including increased hunger, increased interest in calorie-dense highly palatable food, reduced drive to exercise, and alterations in hormones that influence appetite and body fatness. Dan Pardi presented his research at AHS13 showing that sleep restriction reduces willpower to make healthy choices about food. We also know that genetics has an outsized influence on obesity risk, accounting for about 70 percent of the variability in body fatness between people in affluent nations (2). I have argued that “fat genes” don’t directly lead to obesity, but they do determine who is susceptible to a fattening environment and who isn’t (3). I recently revisited a 2010 paper published in the journal Sleep by University of Washington researchers that supports this idea (4). Dr. Nathaniel Watson and colleagues used twins to tease apart what proportion of obesity risk is due to genes vs. environment, and if sleep duration influences that relationship. Consistent with other studies, genetics explained 60 percent of the variability in body fatness between participants. Also consistent with other studies, people who slept less tended to be fatter. However, what sets this study apart is that they determined how sleep duration influences the relationship between genetics and body fatness. What they found is nothing short of remarkable. In people sleeping less than 7 hours per night, genetics determined 70 percent of body fatness, while the environment (lifestyle/diet and ‘random’ effects) explained only 30 percent. In people sleeping more than 9 hours per night, genetics only explained 32 percent of body fatness, while environment explained 68 percent. In other words, in people who sleep more than 9 hours, the environment and not genes was the primary determinant of body fatness. Our work suggests latent genetic variability in susceptibility to obesity requires activation by sleep curtailment. In other words, in an obesity-promoting (low-sleep) environment, people who are genetically susceptible to obesity gain fat, while in a non-obesity-promoting (high-sleep) environment, genetic risk factors are less relevant and don’t influence body fatness as much. “Obesity genes” act primarily in an obesity-promoting environment. As a whole, I find the sleep-obesity research quite compelling. This is one of the reasons why the Ideal Weight Program focuses on improving sleep quantity and quality, a strategy that sets it apart from nearly every other fat loss program. We combine a tracking system that provides consistent objective feedback on sleep habits, with sleep guidance that helps overcome barriers to restorative sleep. The major discovery could lead to quick and effective ways of curbing Britain’s spiralling obesity problem. It was made by researchers at the University of Copenhagen who discovered a number of genetic links to over-eating. Once people become aware of these traits they could make lifestyle changes to help prevent themselves gaining weight, the researchers believe. Professor Haja Kadarmideen, who led the research using 1,200 pigs, said they have confirmed that genetics play a huge role in both how much we eat and who is more likely to pile on the pounds. For some pigs with certain genes, overeating was normal behaviour. Israel and Hamas in the Gaza Strip. and even hypnotherapy to reduce stress. The study of obesity genetics dates back more than half a century. In 1949, researchers at the Jackson Laboratories identified a remarkably fat mouse, which they determined carried a spontaneous mutation in an unidentified gene. They named this the “obese” (ob/ob) mouse. 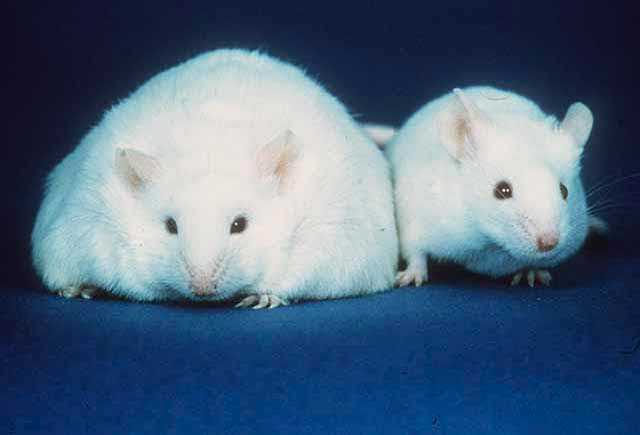 Over the next few decades, researchers identified several other genetically obese mice with spontaneous mutations, including diabetic (db/db) mice, “agouti” (Avy) mice, and “Zucker” (fa/fa) rats. At the time of discovery, no one knew where the mutations resided in the genome. All they knew is that the mutations were in single genes, and they resulted in extreme obesity. Researchers recognized this as a huge opportunity to learn something important about the regulation of body fatness in an unbiased way. Unbiased because these mutations could be identified with no prior knowledge about their function, therefore the investigators’ pre-existing beliefs about the mechanisms of body fat regulation could have no impact on what they learned. Many different research groups tried to pin down the underlying source of dysfunction: some thought it was elevated insulin and changes in adipose tissue metabolism, others thought it was elevated cortisol, and a variety of other hypotheses. At the same time, several groups were researching a fascinating new “anti-lipogenic factor” (also “satiety factor”) they had identified by literally fusing together obese and normal rats, allowing their circulation to (very slowly) communicate (1). Their results suggested the existence of a previously unidentified, powerful circulating factor that regulates food intake and body fatness, and they were able to rule out insulin, glucose, fatty acids, cortisol, and a variety of other potential contenders. Furthermore, their findings suggested that ob/ob mice lack the anti-lipogenic factor, db/db mice lack its receptor, and the factor acts primarily in a brain region called the hypothalamus (2). Yet the identity of the factor remained unknown until 1994. Further work confirmed that leptin is produced primarily by fat cells and acts in the brain to constrain food intake and body fatness (4). Remarkably, all of the original single-gene mutations that cause rodent obesity ended up being in the leptin signaling pathway. ob/ob mice lack leptin, db/db mice and fa/fa rats lack the leptin receptor, and Avy mice have a mutation that mimics the effects of leptin deficiency in the brain. The obesity, elevated insulin, and alterations in fat cell metabolism in these models were all downstream consequences of defects in the leptin signaling pathway– via the brain. Shortly after the cloning of the leptin gene, researchers identified a family of humans that also lacked leptin function (5), providing “the first genetic evidence that leptin is an important regulator of energy balance in humans”. 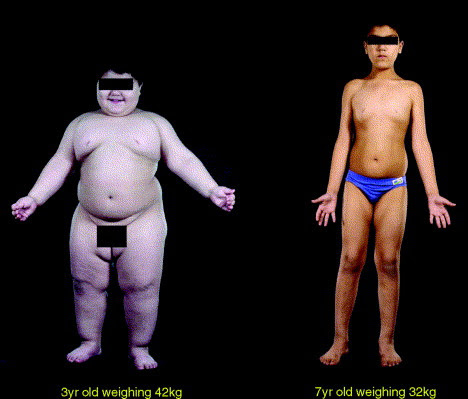 Not only were they obese, with an abnormally large appetite, but treating them with leptin normalized their appetite and returned them to a normal weight (6), as shown in the photo to the left (6b). As of 2013, a number of human families with obesity due to single-gene mutations have been identified. If we consider only those mutations that cause obesity without causing significant developmental abnormalities, all of them turned out to be in the leptin signaling pathway– either in leptin, the leptin receptor, or the brain circuits that respond to leptin and related signals (7)*. As was the case in rodents, spontaneous mutations in humans pointed to the leptin-brain axis as the primary regulator of body fatness. More recently, researchers have performed large-scale genetic screens on people who have severe or early-onset obesity to see if some cases can be attributed to variance in specific genes. About 4 percent of severely obese people have a mutation in the melanocortin receptor 4 (MC4R) gene that causes it to lose function (8), and two recently published papers identified a loss-of function variant of the gene SIM1 in another subset of early-onset obese subjects (9, 10). MC4R is a receptor for alpha-MSH**, the product of leptin-responsive POMC neurons, and SIM1 is an important protein for the development and function of the paraventricular nucleus of the hypothalamus, a major target of POMC neurons. In other words, they are both part of the same system in the brain that regulates body fatness in response to leptin and other signals. Both the MC4R and SIM1 variants cause an increase in food intake due to a defect in satiety (11). For people with these variants, achieving real leanness is unlikely. Other studies have also uncovered mutations in genes associated with the brain regulation of body fatness in severe early-onset obesity (11b). So far, I’ve described rare mutations that lead to severe obesity. These mutations only account for a very small fraction of the obese population. To understand what genes are involved in common obesity, we’ll have to turn to another method: genome-wide association studies (GWAS). The GWAS method takes advantage of the fact that everyone’s genome is a little bit different. By sequencing these areas of difference between people***, they can associate them with specific traits, for example, obesity. This allows researchers to “map” sites of particular importance to the trait in question, which tells us something about what biological processes are relevant to the trait. For example, diabetes-linked regions are mostly associated with genes affecting the pancreas, as one would expect (12) though some obesity genes do show up as well****. …when we look at the information gleaned from the past 15 years of molecular genetic activity we cannot avoid concluding that, as much as type 2 diabetes is clearly a disease in which pancreatic beta-cell dysfunction is a critical element, obesity is a condition in which inherent genetic predisposition is dominated by the brain. That being said, GWAS studies have failed to identify the majority of the genetic differences that account for the 70 percent heritability of body fatness (less than 3% accounted for). We have enough information to know what types of biological processes are involved in common obesity, but we don’t know all the details yet. As the old saying goes, “more research is required”! The brain is the main regulator of body fatness. The brain regulates body fatness in response to internal signals of energy stores, particularly leptin. Genetic variability in body fatness is likely predominantly determined by genetic differences in brain function, particularly the hypothalamus. In the next post, I’ll explain why genes are not (usually) destiny. * Those that do cause deformity also involve brain energy balance circuitry (14). ** Also AgRP, which is an inverse agonist at the MC4R and increases food intake. **** E.g., FTO, the #1 obesity GWAS hit. MONDAY, June 17 (HealthDay News) — Two new studies offer some solace to those who can’t control their weight despite diet and exercise by providing more evidence that genetics may play a role in obesity. One study offers unique insight because it finds genetic mutations in severely obese children that suggest their excess weight may be more connected to their DNA because they put on pounds at such a young age. The other study found that certain genetic traits boost the risk of obesity in families. Previous research has shown that certain genetic variations boost the risk of obesity, but not in everyone, said Daniel Belsky, a postdoctoral fellow at Duke University’s Center for the Study of Aging and Human Development. “Many people who carry a high load of common genetic risks remain lean while others who carry a light load of common genetic risks develop obesity,” he said. The two new studies, both published in the June 17 issue of the Journal of Clinical Investigation, examine variations in the SIM1 gene that are very rare but may have a big effect on the people who have them, Belsky said. “The purpose of studying these variants is to learn something about obesity — what systems are disrupted and how — with the aim of guiding the development of new treatment and prevention strategies,” he said. In one study, researchers found several genetic mutations in 2 percent of 2,100 severely obese kids with an average age of 10, but in fewer than 0.1 percent of the others. “When the genetic variations do occur, they play a major role in a person’s weight,” study co-author Farooqi said. In the other study, researchers studied the DNA of hundreds of children and adults (many of them severely obese), as well as the DNA of children who seem to have a condition called Prader-Willi syndrome, which can lead to overeating and out-of-control obesity. Led by a researcher from the Lille Pasteur Institute in France, the study authors linked three genetic mutations — related to those in the other study — to a high risk of obesity in families. Scientists suspect that the genetic variations in the studies affect hunger and the way the body handles energy. What can people do if their genes put them at higher risk of obesity? For now, nothing beyond trying the usual weight-loss strategies, such as diet, exercise and surgery. There are a lot of different opinions and strong emotions when it comes to the topic of obesity and weight loss. This article is simply another opinion about obesity in America. By writing this article, I am not trying to convince anyone of anything; I’m just trying to give you something to think about — perhaps a new idea. The statistics regarding obesity in America are alarming. Currently, 35 percent of American adults are obese (CDC, 2012), and that number is projected to rise to over 50 percent in most states by 2030 (Henry, 2011). We’ve been fighting the so-called “war against obesity” since the 1980s, and yet despite all of our efforts, the problem has only gotten worse. Clearly, what we’ve been doing to try to solve this problem isn’t working and is possibly making it even worse. In my opinion, the reason for this is that the psychological piece hasn’t been addressed yet and until it is, we will have an increasing problem on our hands. Years ago I was seeing a client who we’ll call Sarah. Sarah was very obese and desperate to lose weight. Her doctor had recently told her that if she didn’t lose a significant amount of weight she would lose her mobility as well as have a host of other medical consequences. Sarah tried numerous diets and exercise programs but nothing worked. She even enrolled in a weight loss clinic but had no success. She actually ended up gaining even more weight during this time. Not knowing what else to do, Sarah’s doctor told her that she needed to talk to a therapist. When I met Sarah she was quite desperate to lose the weight and very depressed. Much to her surprise, I told her that I didn’t want us to work on her losing weight, but rather I wanted to work on her depression and teach her to accept and love herself unconditionally. This seemed the opposite of what she needed in order to lose weight, but Sarah decided to trust me anyway. You see, like a lot of people, Sarah thought that if she could just hate herself enough, that would motivate her to do whatever it took to lose the weight. As a therapist, I know that that is simply not going to work. We therapists follow something called the “Rogerian hypothesis,” which states that people tend to move in a positive direction only when given unconditional love and acceptance. Well, I’m happy to say that after we had alleviated Sarah’s depression and she had learned to love and accept herself, the weight came right off. The current methods for helping people lose weight seem to be the opposite of love and acceptance. Much of the efforts seem to involve trying to shame and scare people into losing weight. This simply doesn’t work. The worst thing you can do is give someone more anxiety and depression regarding their weight, and I’m going to explain why that is later on. Also, the ways we go about teaching people to lose weight are much more complicated than they need to be. One should not have to read a book, go to a clinic, or take a class to learn how to lose weight. There is a very successful diet that has been around for thousands of years and all of the big celebrities do it. Can you guess what it is? It’s called “Moving more and eating less.” How you go about accomplishing this is up to you. I believe that losing weight is not complicated and that people intuitively know how best to do it when it comes to themselves. They simply need to stop feeling so anxious and depressed about it. Before I talk more about how obesity is linked to depression and anxiety, I first want to briefly address the popular belief that obesity is purely a problem of bad genes. This is the popular belief and I can see why it is so popular. In a society where people are constantly trying to shame you about your weight, it can feel good to be able to say “Hey, you have no right to shame me about my weight! It’s not something I can control! It’s because of these bad genes I have!” But in order for this to be true, it means that our genes would have had to somehow change since the 1960s. Scientists agree that genetics is not responsible for the obesity epidemic, although they do agree it is a factor. Depending on which study you look at, genes only account for between 1 percent and 5 percent of a person’s body mass index (Li et al., 2010). I think that most people would agree that 5 percent of bad genes doesn’t excuse the 95 percent of it that scientists claim is due to bad habits. When confronted with these facts, people often cite that most of the people in their family are also obese, so it must be genetics. However, the more likely possibility is that families tend to eat the same foods and have similar habits. Genetics also doesn’t explain why obese people also tend to have obese pets (Bounds, 2011). Obviously the dog doesn’t share the same genes as the owner, but they do share the same environment. Of course, we can’t mention genetics without looking at twin studies. Since identical twins have identical genes, researchers often compare twins to examine the effects of genetics and the environment on a person. Researchers aren’t quite sure if obesity causes depression or if depression causes obesity, but the two are definitely linked. In fact, the two conditions are so intertwined that some are calling obesity and depression a double epidemic. Studies have found that 66 percent of those seeking bariatric, (weight loss) surgery have had a history of at least one mental health disorder. And of course, it doesn’t help that the medications people take for depression and other mental health issues can cause dramatic weight gain. Consider this: According to the CDC, half of Americans will suffer from some sort of mental illness, and most of them will not receive any treatment for it. 63 percent of Americans are also overweight or obese. There are almost as many Americans taking diet pills as there are taking antidepressants (8 percent and 10 percent). People with mental health issues are twice as likely as those without them to be obese, and that’s even before they start taking psychiatric medication (McElroy, 2009). So why are people with mental health issues so much more likely than those without them to be obese? We know that depression and bipolar depression slows down your metabolism (Lutter Elmquist, 2009). Depression also depletes our willpower, making us less likely to avoid eating unhealthy foods. Depression also causes us to crave high-fat foods and sugar. This is where emotional eating comes in. When we’re feeling down, fatty and sugary foods make us feel better, at least temporarily. Of course, you don’t need to have depression or a mental illness in order to engage in emotional eating. It’s something we learn at a very young age. Eating something unhealthy is much easier than fixing the problem or dealing with what’s causing us to feel unhappy. Teaching people how to deal with unpleasant moods other than by eating would certainly cut down on emotional eating and would certainly lead to significant weight loss. So if depression causes weight gain and antidepressants cause weight gain, then what is the solution? Well, research has shown that talk therapy is just as effective at relieving depression as antidepressant medication (Doheny, 2010), and talk therapy doesn’t have the negative side effects that medication does. Another option is exercise. In a 2005 study on the effects of exercise vs. Zoloft (anti-depressant medication) on the treatment of depression, participants were randomly placed into two groups. On group received 150 mg of Zoloft while the other group engaged in 20 minutes of cardiovascular exercise three to four times a week. After eight weeks, they found that the exercise was just as effective at reducing depression as the Zoloft! Another thing to consider is that Zoloft has negative side effects such as weight gain, sleep problems, and sexual dysfunction. As you can imagine, the side effects of exercising are the opposite of that. Washington: A team of American scientists has successfully reprogrammed insulin-producing cells in an effort to discover a new way to fight diabetes. For years, researchers have been searching, with limited success, for a way to treat diabetics by reactivating their insulin-producing beta cells. The “reprogramming” of related alpha cells into beta cells may one day offer a novel and complementary approach for treating type 2 diabetes. Treating human and mouse cells with compounds that modify cell nuclear material called chromatin induced the expression of beta cell genes in alpha cells, according to a new study that appears online in the Journal of Clinical Investigation. “This would be a win-win situation for diabetics — they would have more insulin-producing beta cells and there would be fewer glucagon-producing alpha cells,” says lead author Klaus H. Kaestner, PhD, professor of Genetics and member of the Institute of Diabetes, Obesity and Metabolism, Perelman School of Medicine, University of Pennsylvania. Type 2 diabetics not only lack insulin, but they also produce too much glucagon (a hormone that raises blood glucose levels), reports Science Daily. “We treated human islet cells with a chemical that inhibits a protein that puts methyl chemical groups on histones, which — among many other effects — leads to removal of some histone modifications that affect gene expression,” says Kaestner. “We then found a high frequency of alpha cells that expressed beta-cell markers, and even produced some insulin, after drug treatment,” he says. According to new research, published in the Proceedings of the Royal Society journal, the urge to keep fit is in a person’s genes and this love can be passed on from generation to generation. The same goes for people who are predisposed to laziness, www.telegraph.co.uk reports. The new research is thought to make way for the treatment of laziness. Doctors will now be able to treat inactive individuals by targeting their genes. The study was conducted on mice at the University of California. Scientists found that with the help of selective breeding, the activity levels of the mice could be increased. According to www.dailyexpress.co.uk, it transpired that mice bred with the ability to run faster had offspring who did the same, showing that traits can be passed on genetically. Researchers believe that these findings are also applicable to humans. They say that with the help of pharmacological help, people would be more likely to get involved in voluntary exercise. The medication would make it less comfortable for couch potatoes to sit around for extended periods of time. According to a health report published by www.bbc.co.uk, a research has revealed twelve new type 2 diabetes genes. The study was conducted by a consortium of researchers along with the scientists from Edinburgh University and it revealed some important genes related to the type 2 diabetes. The research has made the researchers think that the findings will now tread the path for new diabetes treatments. The working cells in the body that produce insulin have the involvement of these new genes. With this research, the number of genes linked to type-2 diabetes has reached 38. According to www.bionews.org.uk, the genes that have been found out also have some other variants that raise the risk of coronary heart disease and prostate cancer. The researchers at Oxford University were leading the research. DNA samples of more than 8,000 diabetic people were compared with 40,000 other samples by the researchers from countries like UK, USA, Canada and Europe. According to Dr Jim Wilson, of Edinburgh University: “One very interesting finding is that the diabetes susceptibility genes also contain variants that increase the risk of unrelated diseases, including skin and prostate cancer, coronary heart disease and high cholesterol. Celebrities who have type 2 diabetes include Brittany Murphy and Halle Berry. Celebrities who suffer from type 1 diabetes include Nick Jonas and Bret Michaels.